Momo is already adorable but when she gets a shrieking chicken she is ten times cuter playing with the chicken and even holding the microphone to its mouth. If you've seen 'Go Go Snow White Version' you might recognize this supreme money gun. j-hope actually received it from a fan during one of his fan meets and you can tell by how happy he is that it was a great gift to have. Probably one of the most extravagant gifts ever received during a fan meet that made everyone, especially the receiver Song Min Ho, drop their jaw in surprise. 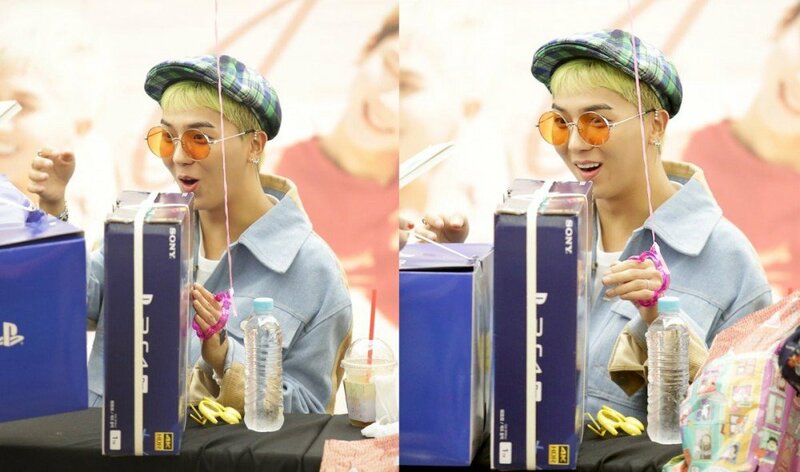 A PS4 is not cheap but this generous fan gifted it to Song Min Ho, causing him to smile with pure glee. Changseob may be recognizable as the idol that remembered a fan for rejecting his handshake during a fan meet. But he's definitely an idol worth noticing during fan meets because he always has the best reactions especially when he received an expensive Korean beef set from his fan. Jisoo is the most adorable eldest member of a group and she proves her youth with the way she interacts with her members and the fans. When she receives a bubble gun, she can't help but express her excitement and childish behavior. The best fan gifts are the ones that can be used to tease a fellow bandmate. When Sechskies was given an electronic cockroach the only thing that made sense was to run it along the table and Kang Sung Hoon gave quite the reaction. Idols generally are very happy when they receive gifts from their fans but Jungkook's expression is so much more lovable when he found out he got food. The look of pure happiness on his face is a great reminder of how sweet and pure this young boy actually is. It's hilarious when idols receive alcohol because their reaction is priceless. And Hani's reaction is incredibly adorable. One of the most common gifts received at a fanmeet is headbands and idols always switch between the head gear they receive. But Wendy doesn't play. Instead of switching out her caps she just chooses to wear all of them. What about when the tables are turned? Here, a lucky fan is gifted a precious hug by G-Dragon in Japan.